Details Rublev Colours Prussian Blue is an intense deep blue color used by watercolorists since its inception in the 18th century. 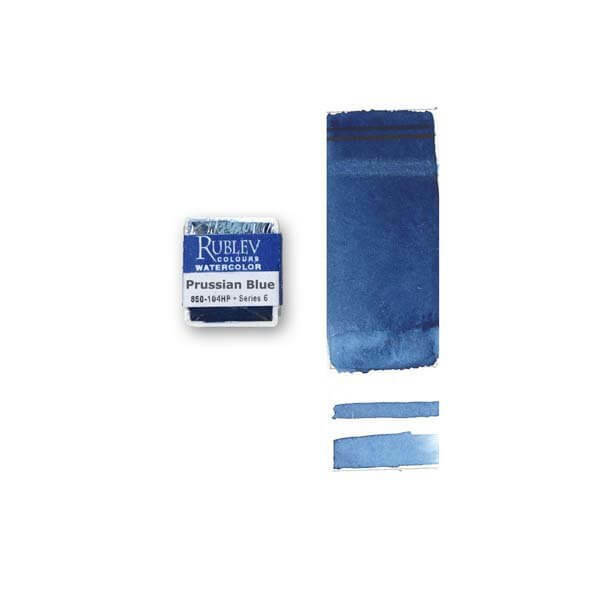 Often called the first of the modern pigments, Prussian blue was introduced in the early 1700s. A German color maker in Berlin named Diesbach accidentally discovered the dark blue pigment in 1704, after using alkali prepared from "animal oil" obtained from an alchemist named J. C. Dippel to prepare Florentine lake. Note: Colors swatches are shown in mass tone, at top, mixed with an equal amount of water and brushed out toward the bottom. All pictures of color swatches in this web site are only approximations of the actual color of the watercolor paint. We have taken every care to match the color in these pictures on calibrated color monitors to the actual color. However, because of the wide variance in color monitors the results you get may vary. Note: Some separation of pigment and medium may occur in Rublev Colours Watercolors and is a natural process when no stabilizers are added to paint to prevent this from occurring.